In 2014, solar industry is expected to welcome a prosperous year around the world. In Taiwan, the solar system market has also shown its booming growth in recent years. Aiming at the subsequent needs of solar plant management, SIC set up their subsidiary, Energyguard Technology Corporation, in 2013. Energyguard combines SIC’s power plant building experience in EPC and extensive inverter installation experience, providing customer with O&M solutions. By prior precautions, the risk of plant damage is reduced. All these customers in 2013 concentrated in the central and southern Taiwan. Energyguard focuses on solar plant’s O&M (Operation and Maintenance) services, including DC box measurements, DC disk inspection, modules cleaning, inverters inspection, high voltage distribution panel and transformer inspection, providing customized supporting services and conducting remote monitoring simultaneously. When Justin Lan, the assistant VP of Electronics and New Energy Group in Skwentex International Corp., accepts Energy Trend’s exclusive interview, he points out that SIC’s agent product, solar inverter, accounts for more than 70% market shares in Taiwan, and SIC has already transferred the after-service of inverter to Energyguard in 2013. When it comes to the opportunity of entering power plant’s O&M services, Justin Lan said that, in the past, those who played the role of plant manager were mostly the owners of power plants or EPC vendors who constructed power plants. From the past experiences, the owners were good at running business model, but they didn’t know much about power plant’s O&M management. Compared to the owners, though EPC teams were good at plant’s O&M management, they still had the needs of outsourcing the subsequent O&M services because of the continuous cases into plant construction. Such demand from the manufacturers was spotted, Skwenpower promoted the concept of O&M management agent so as to solve the problem. 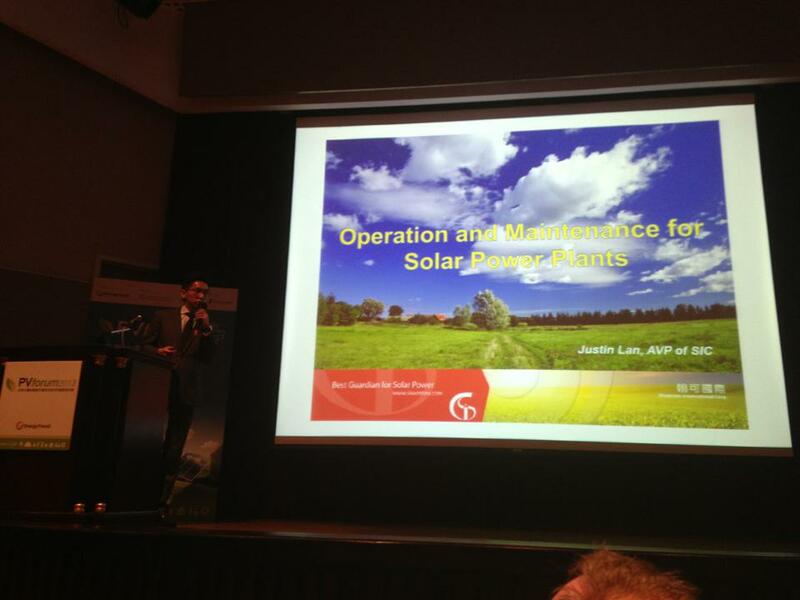 Justin Lan mentioned that, so far, most of Energyguard’s power plant O&M customers locate in the central and southern Taiwan. Viewing from the market in Taiwan, EPC vendors used to be more localized in the past. Somehow, they started to compete with each other across their regions since 2013. For these EPC vendors, once they accept cases across regions, the future plant’s O&M costs will increase. Therefore, the O&M and management agent services provided by Energyguard are the most favorable solutions in this trend. For the owners, on the other hand, if there’s a professional O&M team who can be responsible for plant’s management, the owners’ difficulty of obtaining bank financing is also expected to decrease. To achieve the original estimation of power generation, regular health inspections are essential. Chamber Pan,Energyguard ’s manager, indicated that Energyguard is the only domestic company that can put forward power plant’s complete O&M report. Customers can choose to receive health inspection reports from their plants every quarter, every six months, or every year. By frequent monitoring and regular inspections, minor problems that happened to system can be improved not only to avoid damage to core components but the result of plant’s shut down or even more serious situations. Chamber Pan emphasized that the core of the plant’s O&M management is preventive maintenance. And the keys that Energyguard can provide such complete O&M services are because they have experienced personnel and self-developed monitoring system. Chamber Pan expressed that there are two ways of conducting plant’s O&M monitoring. One is arranging personnel to monitor at the scene, which relies on extensive plant experience from the engineers since they can judge whether there’s potential problem such as overheating by the smells of equipments and disks or the color of screws, which all are the parts that won’t be discovered by remote monitoring. Another monitoring way is to monitor via automatic monitoring system. Due to the fact that general EPC vendors don’t sale to the public their self-developed software and usually have many restrictions on use deadline, Energyguard targeted plant management’s needs of these owners, developing their own monitoring software. By combining the advantages of accumulated large data base of customers, Energyguard is capable of providing customers with more accurate data analysis, helping customers find problems and achieve initiative and instant error detection. Additionally, Energyguard’s self-developed monitoring system is embedded with remote monitoring function. Owners can monitor plants’ conditions via mobile device. Through preliminary understanding of the problem by remote monitoring, supplemented by engineers who can fix the problems with essential tools and parts in the first time, maintenance time is therefore effectively shortened. With the increasingly competitive EPC vendors, price competition may lead to the phenomenon of Gresham's Law (bad money drives out good), therefore resulting in emerges of orphan plants. Justin Lan pointed out that, under such situation, whether there are companies willing to take over these power plants’ subsequent O&E management and costs are also one of the key points. Energyguard targets at these orphan plants’ subsequent operation insufficiencies. By increasing the amount of cases gradually, customers who don’t have big case field can also enjoy the benefit of scale economy. Without paying high cost but with reasonable O&M management costs, Energyguard’s customers can have professional and high-quality power plant O&M management services. After the successful power generation, the subsequent O&M such as Inverter’s maintenance and function inspection, monitoring of plant’s power generation, modules and accessories’ consumption, has always been an easier part that people would ignore. Energyguard aims at this business opportunity and develop a monitoring system, issuing monitoring reports regularly so that plant’s O&M can also have the effect of “prevention is better than cure”. In the O&M costs required, inverter always counts the highest proportion of the key costs. With the agent products from its parent company, SIC, Energyguard takes advantage of the high market share of Satcon and Delta’s inverters, making the whole operation service more complete and cost implement more efficient.